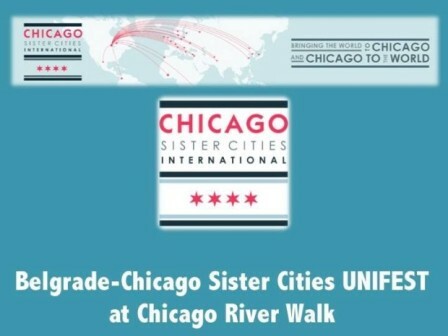 On August 17th, Belgrade, as the sister city of Chicago, was part of the event "UNIFEST on the River" at the city center at Chicago's promenade. In addition to Belgrade, the following Chicago's sister cities were represented: Paris, Milan, Lucerne, Delhi, Petach Tikva (Israel) and Galway (Ireland). Within the program of "UNIFEST on the River" between July 13th and August 17th, all 28 Chicago sister cities were represented. The cities represented themselves through the promotion of food, drink and music. Belgrade was represented through the promotion of Serbian beer donated by the company "LAV Imports" from Chicago. On behalf of the Consulate General event was attended by Dejan Radulovic, Acting Consul General and Leroy Allala, Executive Director of the Chicago Sister Cities International, who expressed his thanks for the support and assistance of the Consulate General.